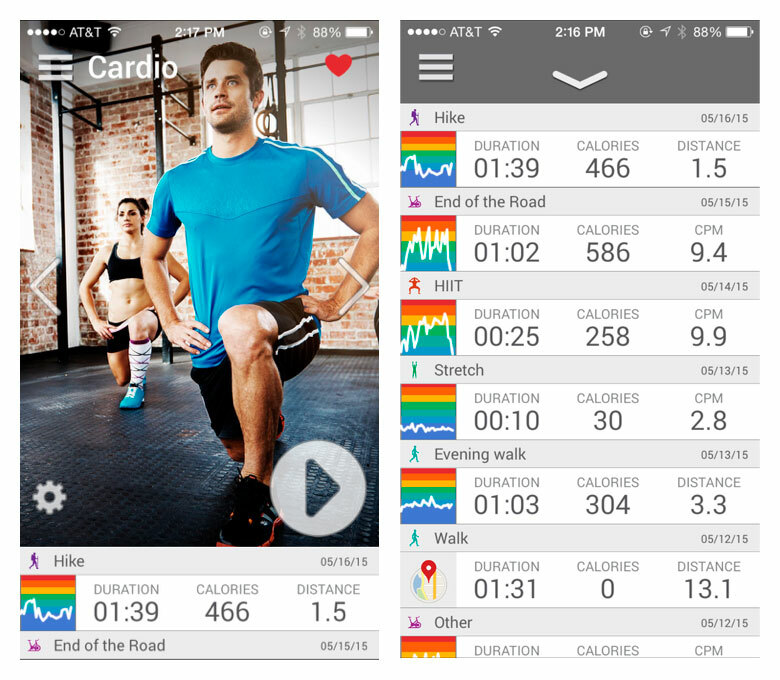 Fitdigits advanced heart rate analysis is now included with the Star Membership. Heart rate analysis helps you monitor how your fitness is changing through time, making sure that your efforts over multiple workouts are balanced to your goals and helping you reach those goals. It can also help you dial in your personal heart rate zones, allowing you to see how the distribution goes at different intensities. 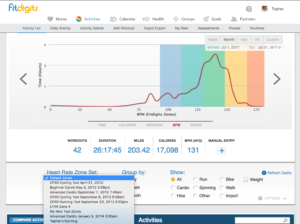 To access new heart rate analysis charts, log into my.fitdigits.com. Go to Activities. Click the arrows on either side of the dashboard display to switch dashboards. Remember, you can adjust your time in the top left corner to view your stats by week, month, year, or custom. By dropping down the options menu, you can also change the grouping of your activities (to select Runs only, Cycle only, etc) and adjust which activity type is displayed. BPM histograms show your heart rate distribution for the given time frame. 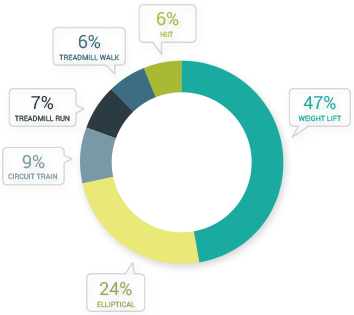 Below is the heart rate distribution for all workouts in 2013. 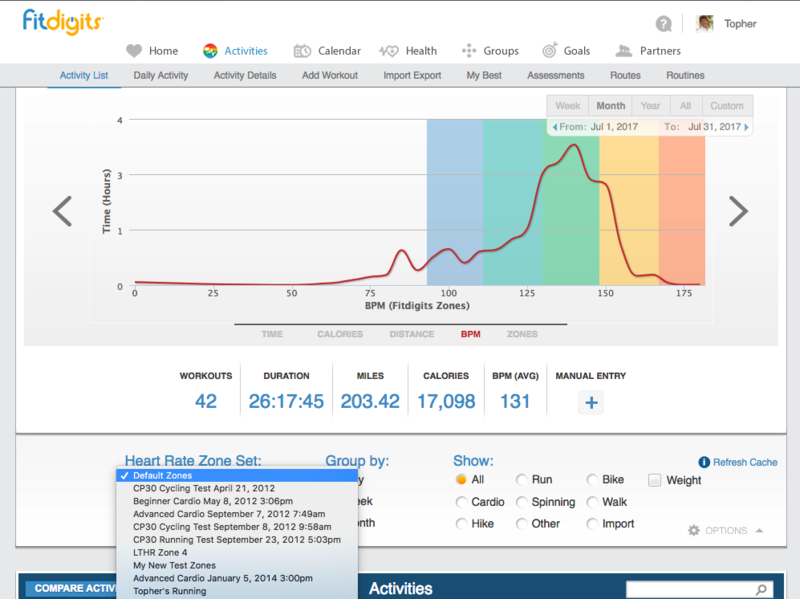 Zones can be determined by dropping the Options section and selecting the heart rate zone set of your choice. 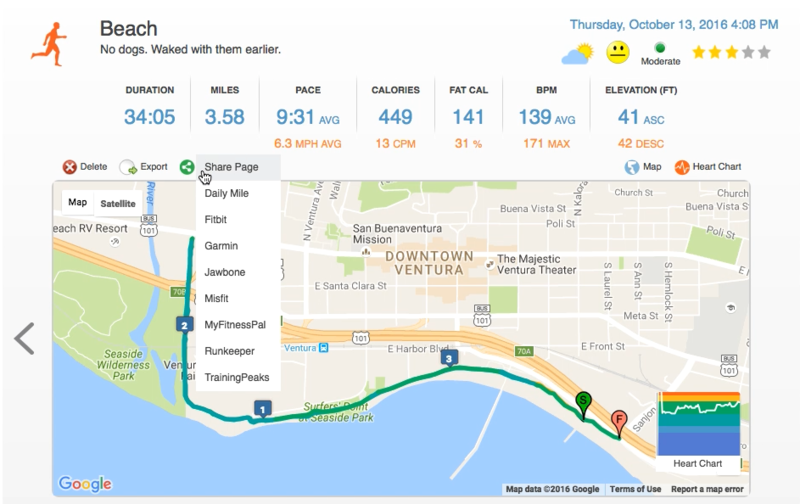 Check out how Fitdigits determines heart rate zones and how accurately determine zones with fitness assessments. If you have had a fitness assessment elsewhere and know your zones, you can also manually enter them. Zone histograms show the time spent in each heart rate zone as well as a percent breakdown for each zone. In the image below, 12% or 7:22 hours of total workout time with heart rate was spent in zone 2. The zone histogram and pie chart will show just how your time in zones adds up. 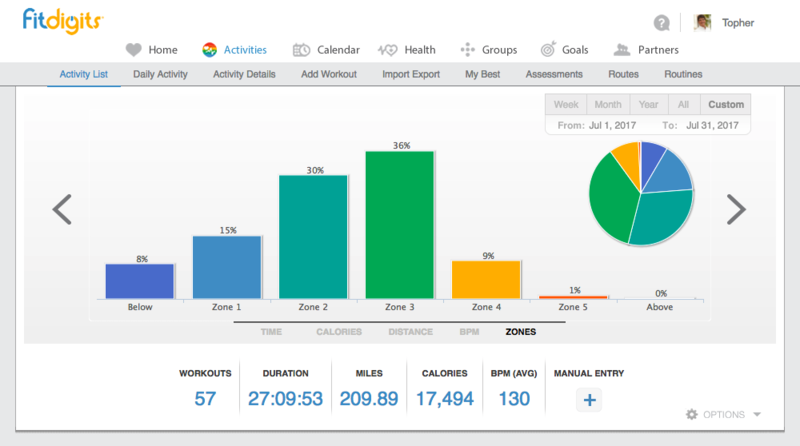 New advanced graphs allow you to see your time in zones over multiple workouts. 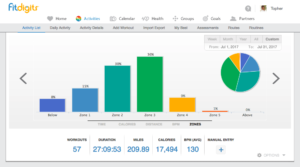 Select to view workouts by month to see how your fitness is changing through time. If you choose, you may also view these changes over all workouts or over a specific workout type. This can be great when you are going through different training stages or have different goals in mind. Are you looking to build your base in the off-season? If so, maybe you want to make sure you are mostly in those lower zones for longer periods of time. Are you looking to improve your stamina at race pace? Or perhaps your power for shorter distances? Each goal has, at its core, a mix of time in the zones; if you are always pushing too hard, it may be time to give your body a break! Can you identify where you are cutting yourself short by not pushing hard enough, or if you aren’t taking enough base building time? Whether doing HIIT or long slow intervals (start slow then taper lol), interval-based exercise has been shown to help you define the best workout to meet your goals. 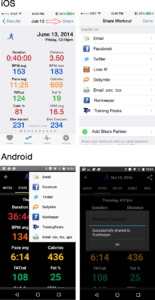 Fitdigits iCardio, iRunner, iBiker and iWalker with a Pro Plus or Star Membership gives you the ability to create and customize your workout definition, getting visual audio cues and coaching through the routines. When you have a plan, this is the place for you. Create workouts based on heart rate or pace zones – ideally created by using one of our fitness assessments. Structured interval workouts based on heart rate are a popular feature, and tend to be more efficient and correct, but many plans are often specified in distance and pace, rather than heart rate. 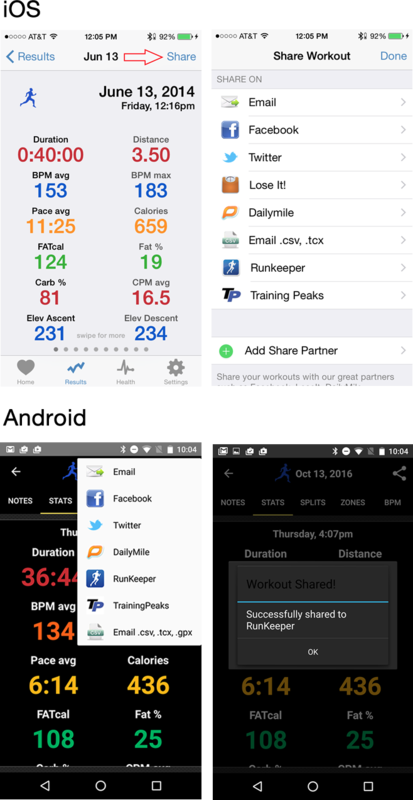 In the app, at the main screen, swipe to select the activity type you would like to create the intervals. Any activity – run, bike, walk, etc, can be chosen. With the Pro Plus package, it comes with some stock routines, targeting different heart rate zones and outcomes, that make a good base for workouts. 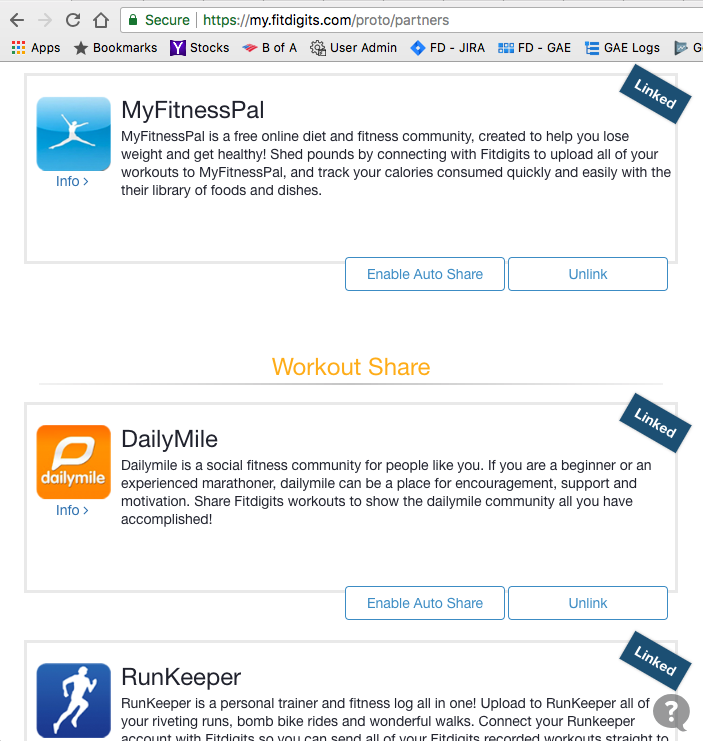 Launch Routine: To launch a created routine, tap the routine name and tap Launch. Tap Edit Routine on that same screen if you want to edit it. Edit Routine: Tap Edit in the top right of the screen. That will bring you to the creating / editing interval workout screen described below. At the bottom of the list of workouts, you will see two different types of interval workouts that can be created with a variety of options. Traditional Time & Distance based, or Music based, which is a variance on time based intervals, where you can specify the length of the interval to also be the length of the song(s) you pick, to match the effort to the beat of your favorites. Set whether the interval will be measured by Time or Distance. If you chose to create a music based routine, it will prompt you for either a playlist or song, see below for more on Music routines. To add more intervals for that series, or even add another series, repeat the above. Check out our Guide on designing fun, effective and interesting interval workouts for more on building fun and effective routines. Choose if you want to automatically start Recovery once the workout is complete, and / or to automatically End once complete. Tap Save in the upper right to save your changes.